***PLEASE NOTE*** there are certain roles in the organization that have elevated privileges to make changes please contact your commissioner if there are questions. In order to login to the SI Play Mobile App, you must have a Sports Illustrated Play or LeagueAthletics.com account. 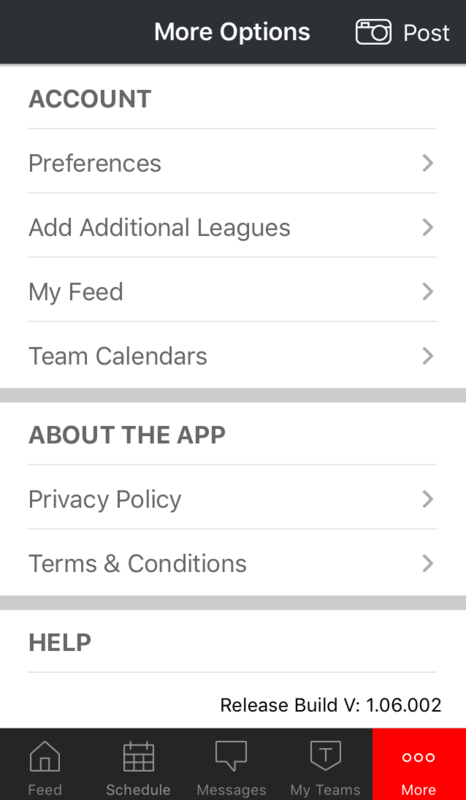 League Administrators cannot login to the SI Play Mobile App unless they are assigned to a team as a volunteer. Enter email and password associated with your website account. Tap on team(s) or player(s) you do NOT wish to follow. Tap Yes, I want notifications. Tap Select Teammates to invite teammates to use app. Tap on teammates you don't want to invite. NOTE: If you forgot your password, tap Forgot your password? on the login screen. A temporary password will be emailed to you. NOTE: You must log into your League Athletics Account on the web to change your contact information in the app. Log in to your account via your league's website. On the upper right-hand corner of your screen, click My Account. Click on the name of the person that you need to update. Edit the information that you would like to change. NOTE: You must log into your Sports Illustrated Play Account on the web to change your contact information in the app. Under Account Information, click Edit. Change the information that needs to be edited. Under Adults, click on the name of the person you'd like to edit. Under Adult Options, click Edit. NOTE: Please note that only iOS is able to subscribe through the app. To the right of each team you'd like to add, tap Subscribe. Tap View Events, or Done. Find your game/practices, tap Attending. Tap the player/volunteer image of the person attending. Tap My Teams at bottom of screen. Left or right swipe on team or player you want to delete. Tap My Teams at the bottom of the screen. Select the + in the bottom right corner of the screen. Uncheck the team(s) or player(s) you would like to stop following. Once complete, select Done in the top right corner of the screen. NOTE: Player Photos are uploaded to an album which is attached to each individual player. It is viewed by tapping the player's card on the Roster. This feature may be disabled for your team. Tap on their Player Card. To the right of Recent Photos,tap View All. Tap All Photos or Create Album. If creating the album, name the album, Save, then tap on the Empty Album. Choose the images you would like to upload. NOTE: Player Photos are uploaded to an album, which is attached to each individual player. It is viewed by tapping the player's card on the Roster. This feature may be disabled for your team. To the right of Recent Photos, tap View All. Tap the + icon, then the Camera icon. Choose the photos from your library. NOTE: Deleting an album will not delete the images uploaded to the album. Go from My Teams > Tap Team Name. Tap the album you wish to delete. At the top right, tap the three dots. On an Android, the dots are vertical. On an iOS device, the dots are horizontal. On the lower right, tap the + icon, then the Folder Icon. Enter the caption for the new album. Scroll to the last album. Tap the Album you'd like to add the photo to. Choose the photo(s) you'd like to upload, or tap the video camera/camera. Tap Done or the Checkmark to upload to the album. Tap the Album you would like to add the photo to. Take the photos or tap Library and choose the photos you would like to upload. Choose a photo from the library, or take one using the Camera. Tap Choose or Use Photo. Upload Photo from Cameraor From Gallery, tap Choose. If Camera-- Take your photo, then tap the Checkmark to upload. If from Gallery- Tap the photo you'd like to upload. Why Can't I See My Favorite Teams? If you cannot see your team/teams roster on the web, you will not be able to see it in the app. Your team has not yet been Activated. The Roster is not being shared publically. You can check with your league registrar to see if these cases apply to your team. NOTE: If you have accounts in both League Athletics and Sports Illustrated Play, and you can see your teams for one account and not the other, please contact support so that we can link your account. If, when trying to subscribe to your Teams Calendar, you receive an error that states you cannot create an account because an identical subscribed calendar already exists, you must delete the old subscribed calendar. Tap Mail, Contacts, and Calendars. Tap the Calendar you wish to unsubscribe. NOTE: If you are a volunteer and do not see the options listed below, please reach out to an administrator within your organization to ensure that you have the proper privileges. In the bottom right corner, tap the "+" to create a new event. In the top right corner, tap Save. In the top right corner, tap the "+"to create a new event.